Eve Garnett (1900-1991) studied art at the Chelsea Polytechnic and the Royal Academy School of Art, which I imagine was no easy road for a young woman in those days. She loved to walk the streets of London drawing from life. 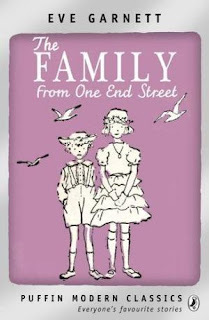 Her drawings in this classic novel are sketchy, as though quickly drawn, and capture the skinny, gangly children of the Ruggles family. 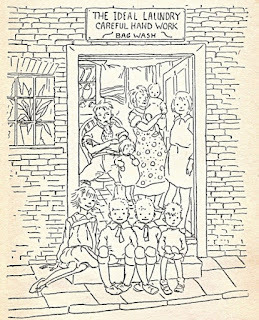 They are a lovely rough-and-tumble family - Mr and Mrs (dustman and laundress) and the seven children, including red-headed twins and baby William. Each chapter focuses on one of the children, and a final glorious adventure for everyone as they travel by train from their village to London to see the parade that Mr Ruggles' brother drives his prize-winning horse and cart in. 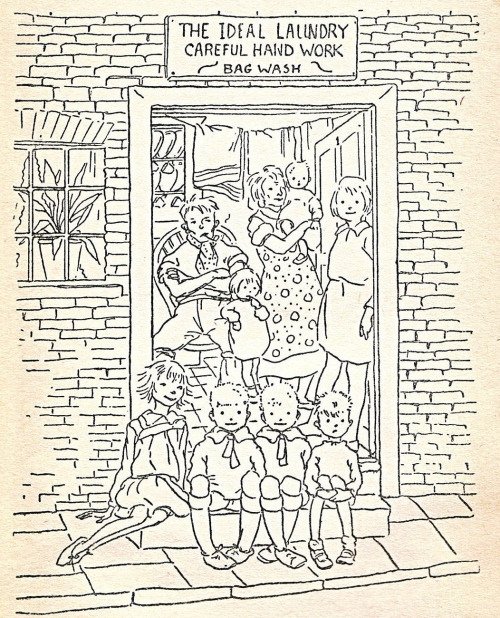 There are disasters and adventures, issues with their constricting clothing and exploits which take children away from home for whole days, without too much worry about where they are, particularly the twins, Jim and John, as they endeavour to prove themselves worthy of joining the Gang of the Black Hand. Lovely stories. I hope I can convince some young readers to give it a go because I think they're as enjoyable as ever they were.